When I survey the wondrous cross by Isaac Watts (1674—1748). When preparing for a communion service in 1707, when he himself was thirty-three years old, Watts wrote this personal expression of gratitude for the love that Christ revealed by His death on the cross. Watts echoes Paul: “But far be it from me to glory except in the cross of our Lord Jesus Christ, by which the world has been crucified to me, and I to the world” (Gal 6: 14). The third stanza repeats almost verbatim phrases from St. Bernard of Clairvaux’s hymn “Salve mundi salutare”: such sentiments would be felt by any sincere Christian who meditated upon the crucifixion. Salve, mundi salutare. This hymn is variously attributed to Bernard of Clairvaux, Bonaventure, and Arnulph von Löwen. O quam nudum hic te cerno! The tune is ROCKINGHAM. Edward Miller (1735 —1807) adapted ROCKINGHAM from an earlier tune, TUNEBRIDGE, which had been published in Aaron Williams’s A Second Supplement to Psalmody in Miniature (c. 1780). Its name refers to a friend and patron of Edward Miller, the Marquis of Rockingham, who served twice as Great Britain’s prime minister. Miller’s father had made his living laying brick roads, and the young Edward became an apprentice in the same trade. Unhappy with that profession, however, he ran away to the town of Lynn and studied music with Charles Burney, the most prominent music historian of his day. A competent flute and organ player, he was organist at the parish church in Doncaster from 1756 to 1807. 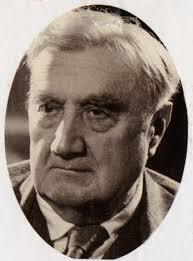 Miller was active in the musical life of the Doncaster region and composed keyboard sonatas and church music. His most influential publications were The Psalms of David for the Use of Parish Churches (1790), in which he sought to reform metrical psalmody (and which included ROCKINGHAM), and David’s Harp (1805), an important Methodist tunebook issued by Miller with his son. “In the new ritual that had to be made, Cranmer omitted all hymns. Ordinary citi­zens could not read Latin and without choirs of monks who were experienced in plain-song tunes, congregational singing was impossible. Thus was discarded, at a stroke, the hymnology that the Roman Church had built up during a thousand years. With the coming of Isaac Watts (1674-1748) English hymnology cast aside the Psalter, and the hymns of human compo­sure came into being. Our hymnals today are liberally sprinkled with Watts’s hymns —”When I Survey the Wondrous Cross,” “Praise Ye the Lord,” “O God, Our Help,” “I Sing the Mighty Power,” “Joy to the World,” “Jesus Invites His Saints,” “Come, We that Love the Lord,” et cetera. Just as I am by Charlotte Elliott (1789–1871). 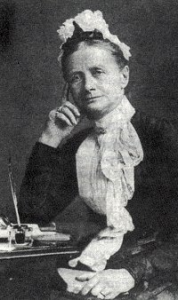 Elliott was an invalid most of her life and was distressed by her inability to help spread the Gospel. She confided to a clergyman her distress that she was unable to offer any service to God. 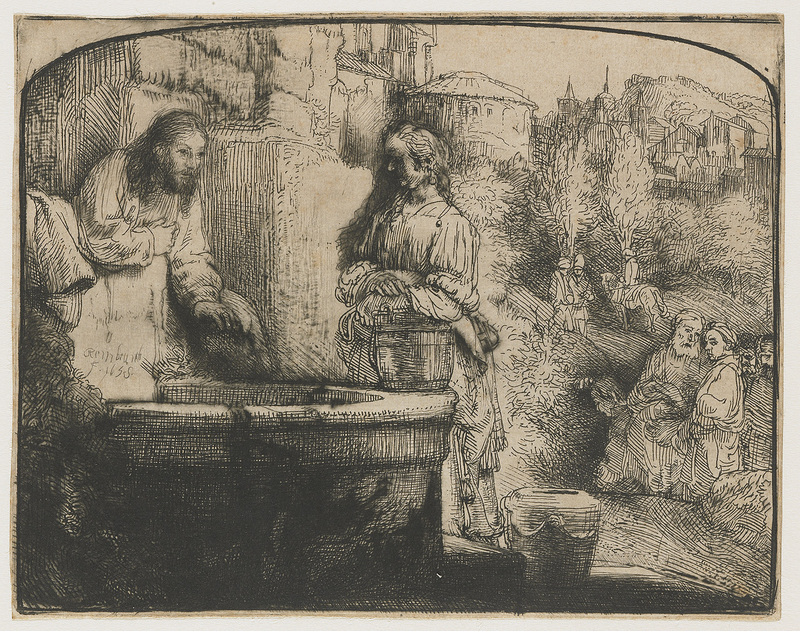 The clergyman told her that “you must come as you are—a sinner— to the Lamb of God who takes away the sins of the world.” When we sin, we, like Adam, want to hide from the face of God. We have nothing to offer Him but He calls and commands us, “Come!” We come in repentance and sorrow to receive his great gift: Himself in the Eucharist. Miss Elliott was the daughter of Charles Elliott of Clapham and Brighton and grand-daughter of the Rev. H. Venn of Huddersfield. She was born March 18th. 1789. The first 32 years of her life were spent mostly at Clapham. In 1823 she removed to Brighton and died there Sept. 22nd. 1871. To her acquaintance with Dr. C. Malan of Geneva is attributed much of the deep spiritual-mindedness which is so pronounced in her hymns. Though weak and feeble in body, she possessed a strong imagination and a well cultured and intellectual mind. Her love of poetry and music was great and is reflected in her verse. Her hymns number about 150, a large proportion of which is in common use. The finest and most widely known of these are: “Just as I am” and “My God, my Father while I stray”. Her verse is characterized by tenderness of feeling, plaintive simplicity, deep devotion and perfect rhythm. For those in sickness and sorrow, she has sung as few others have done. The history of the writing of “Just as I am, without one plea”.— In the Record, Oct. 15th. 1897, Bishop H.C.G. Moule of Durham, the Principal of Ridley Hall, Cambridge, gave a most interesting account of Miss Elliott, and the origin of this hymn. Dr. Moule, who is related to the family, derived his information from family sources. In an abbreviated form, this is the beautiful story — “Ill health still beset her. Besides its general trying influence on the spirit, it often caused her the peculiar pain of a seeming uselessness in her life, while the circle round her was full of unresting serviceableness for God. Such a time of trial marked the year 1834, when she was 45 years old and was living in Westfield Lodge, Brighton … Her brother, the Rev. H.V. Elliott, had not long before conceived the plan of St. Mary’s Hall at Brighton, a school designed to give at nominal cost, a high education to the daughters of clergymen; a noble work which is to this day carried on with admirable ability and large success. In aid to St.Mary’s Hall there was to be held a bazaar… Westfield Lodge was all astir; every member of the large circle was occupied morning and night in preparation with the one exception of the ailing sister Charlotte — as full of eager interest as any of them, but physically fit for nothing. The night before the bazaar she was kept wakeful by distressing thoughts of her apparent uselessness; and these thoughts passed by a transition easy to imagine into a spiritual conflict until she questioned the reality of her whole spiritual life, and wondered whether it was anything better after all than an illusion of the emotions, an illusion ready to be sorrowfully dispelled. The next day, the busy day of the bazaar …. the troubles of the night came back upon her with such force that she felt they must be met and conquered by the grace of God. She gathered up in her soul the grand certainties, not of her emotions, but of her salvation: her Lord; His power: His promise. And taking pen and paper from the table she deliberately set down in writing for her own comfort the formulae of her faith … so in verse she restated to herself the Gospel of pardon, peace and heaven…. there, then, always, not at some past moment, but “even now” she was accepted in the Beloved, “Just as I am”. As the day wore on, her sister-in-law, Mrs. H.V. Elliott, came in to see her and bring news of the work. She read the hymn and asked (she well might) for a copy. So it first stole out from that quiet room into the world, where for sixty years it has been sowing and reaping, until a multitude which only God can number has been blessed through the message”. – O Lamb of God, I come! The tune is ST. CRISPIN, composed by Sir George Job Elvey. He was born at Canterbury on 29 March 1816, was a son of John Elvey. For several generations, his family had been connected with the musical life of the cathedral city. At an early age, he was admitted as a chorister of Canterbury Cathedral, under Highmore Skeats, his brother, Stephen Elvey, being then master of the boys. In 1830, Stephen Elvey having been appointed organist of New College, Oxford, George went to reside with him, and completed his musical education under his brother’s guidance. He studied at the Royal Academy of Music under Cipriani Potter and Dr Crotch. He matriculated from New College on 17 May 1838 and graduated Mus. Bac. on 2 June following, his exercise being an oratorio, ‘The Resurrection and Ascension,’ afterwards performed by the Sacred Harmonic Society at Exeter Hall (12 November 1838), and subsequently at Boston, United States of America, and at Glasgow. On 2 July 1840, by a special dispensation of the chancellor of the university, Elvey graduated Mus. Doc. two years earlier than was allowed by the statutes. His exercise on this occasion was the anthem, ‘The ways of Zion do mourn.’ Two anthems, with orchestral accompaniments, ‘The Lord is King,’ and ‘Sing, Heavens,’ were written respectively for the Gloucester festival of 1853 and the Worcester festival of 1857. Of his best-known works produced chiefly between 1856 and 1860 many were composed for special services at St. George’s Chapel. By the death of the Prince Consort in 1861, Elvey lost one of his most sympathetic patrons. The funeral anthems, ‘The Souls of the Righteous’ and ‘Blessed are the Dead,’ were both written for anniversary services in memory of the prince. For the marriage of the Prince of Wales (1863) he composed a special anthem, with organ and orchestral accompaniment, ‘Sing unto God,’ and for the marriage of Princess Louise (1871) a festal march which attained considerable popularity. He was knighted on 24 March 1871. The last important public event in which he took part was the marriage of the Duke of Albany at St. George’s Chapel on 6 May 1882. In June of that year, he resigned his post as organist. After some years spent in retirement he died at the Towers, Windlesham, on 9 September 1893. 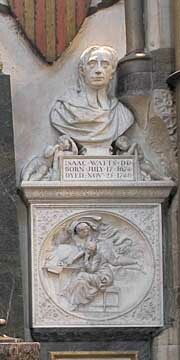 His most famous work is probably the hymn tune DIADEMATA, to which “Crown Him With Many Crowns” is set. A memoir of him, by his widow, was published in 1894. The Hymn “Come, Ye thankful People, Come” to his tune “St. George’s Windsor” is also well-known. The Washington Cathedral choir sings Just as I am. I bind unto myself today. St. Patrick’s Lorica or Breastplate. 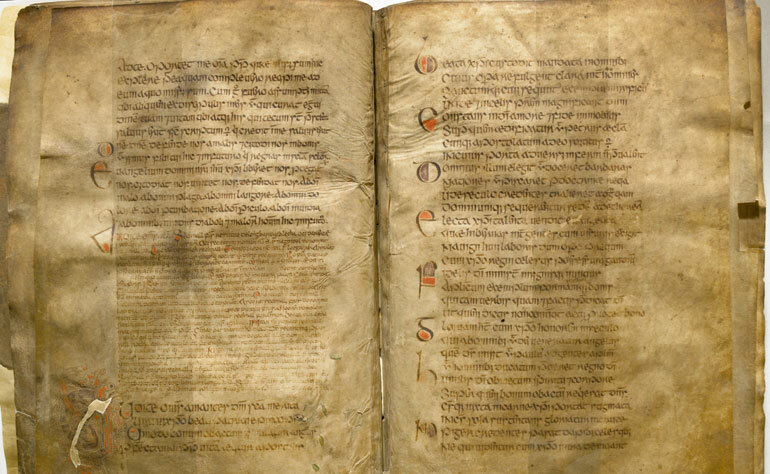 According to legend, on the way to Tara, St. Patrick and his monks was hunted by the scouts of the pagan king Loegaire mac Neill. Patrick sang this poem, which may be modeled after the incantations of the Druids, and the scouts saw Patrick as a deer and his men as fawns; therefore the poem is also called The Deer’s Cry. The themes of this hymn reflect St. Patrick’s preparation for spiritual battle as recorded in his autobiographical Confession. With the whole armor of Christ, Patrick won Ireland for teh Church, and this hymn is a powerful model for our own spiritual battles. 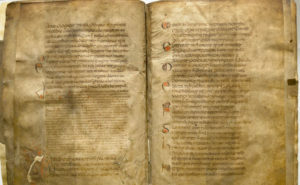 The prayer is part of the Liber Hymnorum, a collection of hymns found in two manuscripts kept in Dublin and published in 1903 in the Thesaurus Paleohibernicus. Whoever should recite the hymnody, would be making a song of praise dear to God, for it wipes out all sins, and cleanses the powers of the body and subdues involuntarily the lusts of the flesh; it lessens melancholy, and (banishes) all madness; it breaks down anger, it expels hell’s angels, and gets rid of the devils; it dispels the darkness of the understanding, and increases holiness; it preserves the health, and completes good works, and it lights up a spiritual fire in the heart, i.e., the love of God (in place of) the love of man, and it (promotes) peace between the body and the soul. 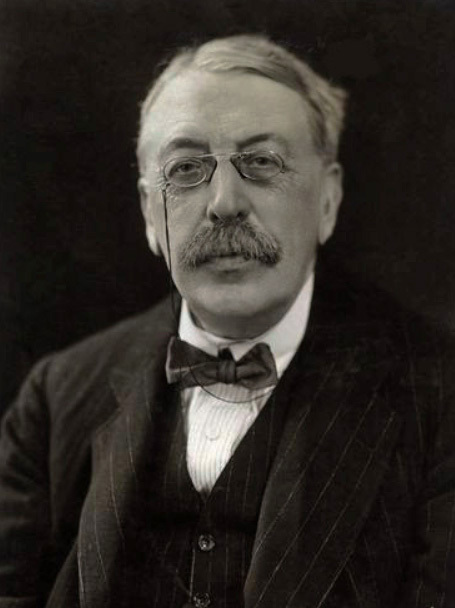 The music to the hymn was originally set in 1902 by Charles Villiers Stanford for chorus and organ, using two traditional Irish tunes, ST. PATRICK and GARTAN, which Stanford took from his own edition (1895) of George Petrie’s Collection of the Ancient Music of Ireland (originally 1855). In many churches, it is unique among standard hymns because the variations in key, length and meter of verses mean that at least three different tunes must be used. The choir of Trinity College, University of Melbourne sings the Lorica. Here is an arrangement by Melville Cook. Both of today’s anthems deal with the theme of living water that Jesus offer to the Samaritan woman at the well. The choir will sing a capella a simple arrangement of I heard the voice of Jesus say. The text is by Horatius Bonar (1808-1889). 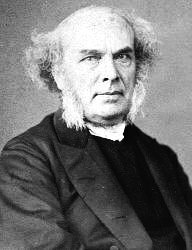 To say that Horatius Bonar had a family history of serving in the Church of Scotland would be an understatement. With Nearly 364 years of service in the church, it was no question what would become of Horatius at some point in his life. Horatius was born December 19th, 1808 to James Bonar who was at the time the Solicitor of Excise in Scotland. Born in Edinburgh, Scotland, Horatius stayed in his hometown and studied at the local High School and the University where, in 1837, he was ordained in the church, and became an assistant to Rev. John Lewis, Minister of St. James’s, Leith, Scotland. In November of that same year, Bonar left St. James and became Minister of North Perish, Kelso, Scotland. In 1843, because of a “great disruption,” in the church, Bonar left the his position at North Perish and joined the Free Church of Scotland. 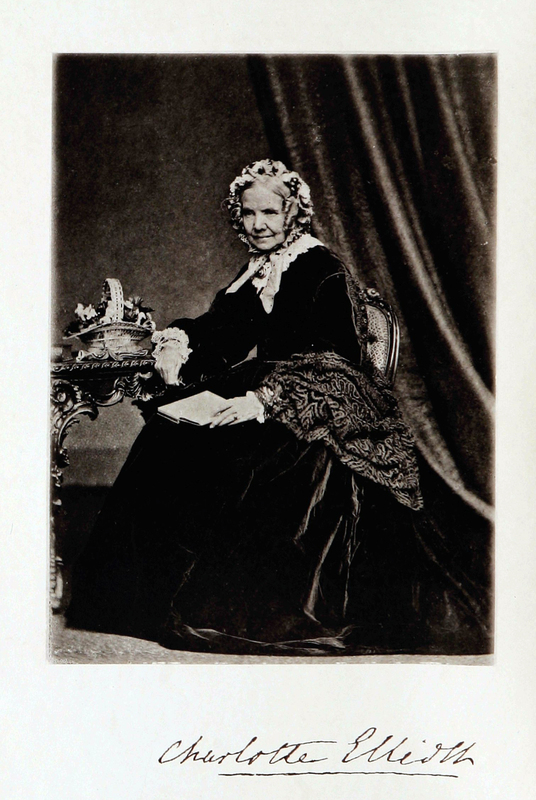 In 1853, the University of Aberdeen conferred upon Bonar the Doctorate of Divinity, which eventually would lead him back to Edinburgh in 1866, when he was placed at Chalmers Memorial Church, The Grange, Edinburgh. This was Bonar’s last call, but in 1883, he was chosen to be the Moderator of the General Assembly of the Free Church of Scotland. He was well known for being a poet. His poems and his life were marked by sadness: Five of his children died young. But later, his widowed daughter and her five children had to move in with him. Many grandparents would groan at the added burden, but Bonar rejoiced. To him it was as if God had given him five children to replace those he had lost. The tune KINGSFOLD is an old English folk song. The tune is written in e minor, but also can be considered a modal tune. The tune was published in English Country Songs (1893), an anthology compiled by Lucy E. Broadwood and J. A. Fuller Maitland. It wasn’t until Ralph Vaughn Williams (1872-1958) heard this folk song in Kingsfold, Sussex, England, that the tune was actually named. After Vaughn Williams had heard the tune, he decided to arrange the tune for the text of “I Heard the Voice of Jesus Say” for the English Hymnal (1906). Here I heard the voice of Jesus say is sung at service of thanksgiving at Westminster Abbey on Sunday to mark the 70th anniversary of the end of World War Two in Europe, 10th Mary 2015. Here it is sung by a youthful choir faster tempo. dum dicitur mihi quotidie: Ubi est Deus tuus? 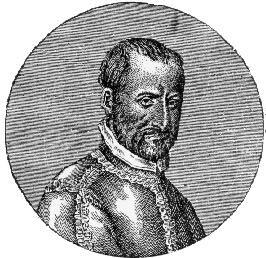 Sicut cervus is likely the best known of Palestrina’s motets.It has the beauty and dignity for which Palestrina’s music is known and judged to be the ideal of Renaissance counterpoint. The motet’s polyphonic flow and gentle melodic arches contain a quiet drama. While the motet’s word-painting is not overt, neither is it hidden. There is a deep feel for the words’ meaning as the voices begin quietly in imitation for the words Sicut cervus (As the hart). At the word desiderat (longs), rhythm quickens and the line rises to its peak at the word: fontes (streams); as the words seek their object, so the melodic lines seek their goal. As the text’s thought turns toward the self with the words ita desiderat anima mea ad te, Deus (Thus longs my soul for Thee, God), shorter motives in closer imitation and intensifying dissonance patterns express the human soul’s fervent desire and bring the motet to its conclusion. Here it is sung by the Westminster Cathedral Choir. And here at Somerville College, Oxford.